Before you start creating videos for your company’s YouTube channel, you want to research keywords on YouTube. Like Google, YouTube includes an auto-suggest feature that shows you what other users are searching for on the platform. If you already have some keyword ideas, you can start typing them into YouTube to see the competitiveness for the term. As with traditional search engine optimization (SEO), you’ll want to aim for long-tail keywords. For reference, a long-tail keyword features three or more words. Unlike short-tail keywords, they’re a high-intent keyword, meaning users know what they’re looking for — they also come with a low search volume, which is what you want. As an example, if you’re a landscaping company, it’d prove challenging to rank for a short-tail keyword like “landscaping ideas,” which posts almost 400,000 results. In comparison the long-tail keyword, “landscaping ideas for sloping backyard” has less than 12,000 results. While it’s essential to research keywords on YouTube, it’s also valuable to look at video-result keywords on Google. What is a video-result keyword? These are keywords that generate video results on Google, alongside traditional website pages. 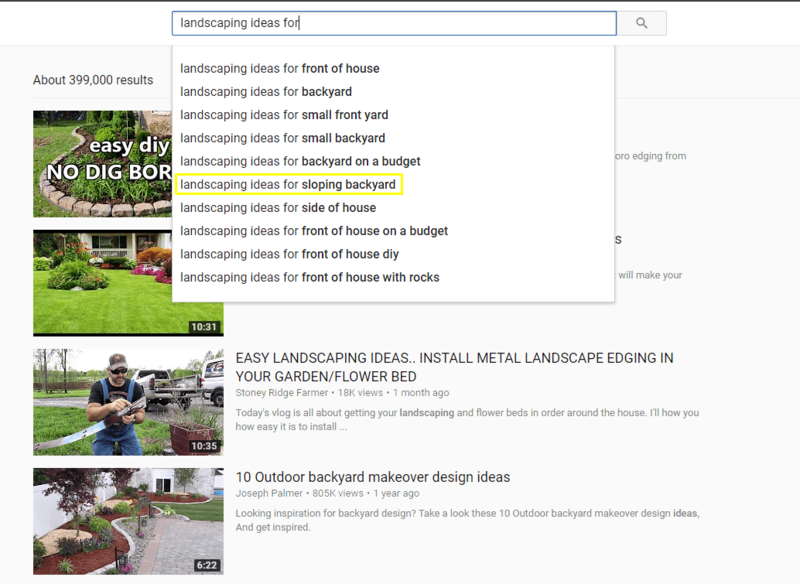 If you search for our previous long-tail keyword, “landscaping ideas for sloping backyard,” you’ll see that it doesn’t generate a video response. That’s understandable, as most video-result keywords are for how-to queries. 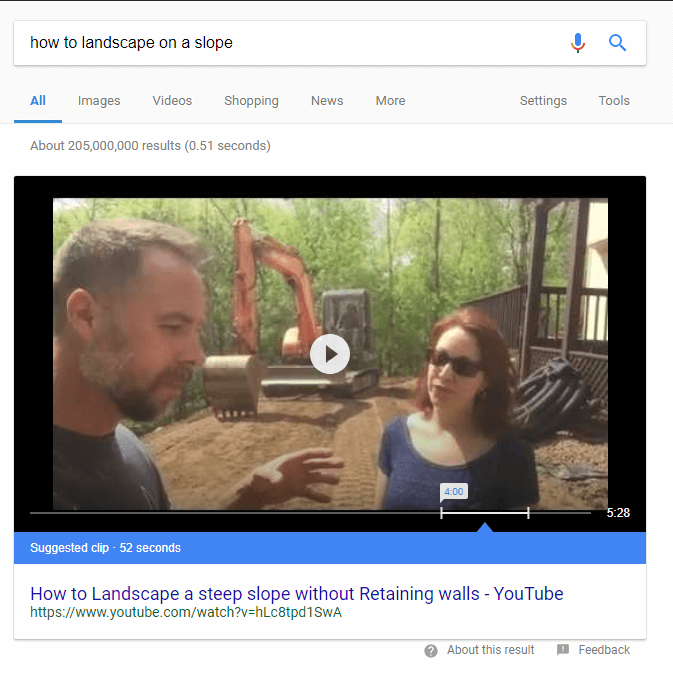 Now, if you search, “how to landscape on a slope,” you’ll see Google pulls up a featured video snippet — which is even better since it appears above organic search results. The video is also the top-ranking video on YouTube for our initial long-tail keyword, which gives you an idea of what you need to beat. People may watch more than one billion hours of YouTube content a day, but they won’t watch any video. They want content that’s creative, original, and compelling. If they start watching your video and find out otherwise, they’ll stop watching — and that hurts your YouTube ranking. Will it start a conversation? Will it answer a question? Will it encourage a conversion? Will it generate a lead? Check if there is similar content on YouTube too. If you do find content that’s on the same topic, look for content gaps that yours could fill. Overall, though, aim for creating videos that are 100 percent original — it’ll make your videos more competitive in the long-term. By the upload dates, views, and comments, you can tell there’s a fair amount of interest in videos that discuss untraditional ways for landscaping a sloped backyard, such as avoiding retaining walls. Users are also interested in a down-to-earth approach from filmmakers. In your video, as well as your video description, you should include a call-to-action (CTA). Depending on your video marketing plan, your CTA may vary by the video and its intended audience. If you’re targeting shoppers researching landscaping options, for instance, you may invite them to subscribe to an email newsletter versus to request a free quote. All videos, however, should include a CTA that invites users to subscribe, like, or comment. Title: Aim to use your keyword in your title. In our ongoing example, the title of your landscaping video may say, “7 Landscaping Ideas for Sloping Backyards,” or “How to Landscape a Sloping Backyard.” Make your title natural and informative. Description: Users skim over your video descriptions, but YouTube and Google read them in their entirety. Why? They can’t watch video, so they rely on text to learn more about it. So, write an engaging description of 300 to 500 words that includes your keywords one to four times. Tags: A tag helps you target additional keywords for your YouTube video. It’s best to include at least 10 tags, which can help your video rank for other keywords on YouTube. Try to stick with long-tail keywords, as long as they’re relevant to your video. Captions: YouTube’s also improving its search results by indexing video captions — which is why you should say your keyword in your videos. YouTube automatically transcribes videos in English, as well as other languages, but it’s important to review these captions in your Video Manager. As you add keywords to your YouTube content, remember to avoid keyword stuffing. While optional, a custom thumbnail can emphasize the quality of your video, plus brand it. If you look at videos from other landscaping companies and businesses involved with the industry, such as Better Homes and Gardens, you’ll notice they customize their thumbnails. It’s an added touch that can engage users and encourage them to click your video. To create your customized thumbnail, you can use several free tools. One is Canva, while another is Adobe Spark. Both have a dedicated section for making a YouTube thumbnail, which makes your day-to-day easier. Add your video thumbnail in YouTube’s Creator Studio via the Video Manager menu. Once you’ve developed, filmed, and uploaded your video, you can start promoting it. A go-to promotional strategy is your social media. Share it with people already following your company, and encourage them to comment. If you’ve created a stellar video, think about sharing it on other websites too. Quora, for example, is a great resource for answering questions about a variety of topics, including landscaping. Different landscaping forums may also help your company connect with valuable leads. YouTube offers companies of all sizes and industries a one-of-a-kind opportunity to connect with consumers, as well as generate new and valuable leads — and with 90 percent of shoppers citing video as an influencing factor on purchase decisions, it’s well worth the investment.